Between March 7 and March 18 – eight working days and half of my 2019 vacation days! – we took our California vacation booked back in November on Westjet’s Black Friday sales and planned largely in February. It’s so cute that at 3.5 years old, kiddo has an understanding of travel and anticipation for what is to come and appreciation of the wonders that lie ahead of him. The trip would span over my birthday, enable us to visit friends living in LA and travel with Vancouver friends. It was also chockful of kid-friendly activities like Legoland! 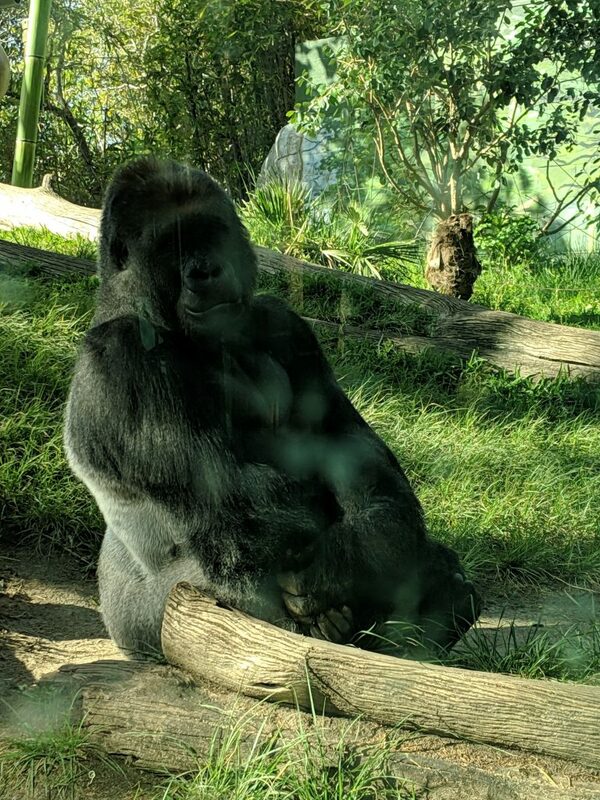 San Diego Zoo! Disneyland! On travel day, for our 4:15 p.m. flight, we succeeded in napping the kid for a little over an hour. I dressed us in matching panda raglan shirts because I thought it would be cute for traveling. At this point in time, it’s only cute on him! After wiping everything down with powerful lemon-scented Vim wipes – NPY is self-conscious but I like the reassuring 99% bacteria killed feature – we settle in. It’s a battle between NPY and kiddo for the window seat and after an hour after take-off, NPY ousts kiddo. My preference is the window seat, too, but I never get it any more. :S Kiddo likes to flip through the airline magazine which has the page showing the airline’s fleet. 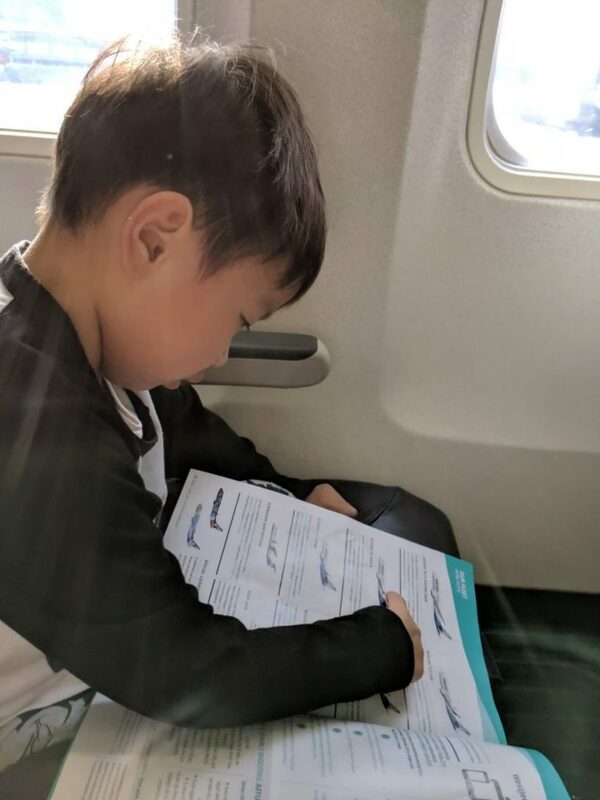 He also likes to look at the illustrations on the safety card and ask me what it means and I describe it to him and make NPY all the more anxious about the very unlikely but possible unfortunate events. With an hour left in the flight, I went to the washroom and when I got out, I noticed a spill right at my seat and a young woman/girl standing over it. My first thought was that she had spilled an ice coffee drink. But actually, she was racing from her seat rows ahead of mine to the washrooms in the back but stopped to vomit – in my row. To let the miserable girl pass, I stepped into a vacant seat and the people across the aisle told me that it was empty and I could hang out there. Which I did while peeking at the progress of the cabin crew in wiping up the mess and sprinkling what looked like ground coffee presumably to absorb odours. That was the eventful occurrence on that flight! NPY surreptitiously was moving my knapsack away from under the seat which still had some spatter. He didn’t want me to use more Vim wipes to wipe my seatbelt that was dangling over the edge or my seat, encouraging me to ask for the less fragrant wipes the crew were using. I declined that suggestion because I thought it would make more work for the crew, imply they weren’t careful enough, and I know the power (stated on/of) my wipes! Our most recent trip was to Halifax in December where we had a suitcase for each, the kiddo’s being a carry-on size. No stroller, no car seat. When we last flew together in July 2017, we had a car seat but no stroller. This time, we felt the full brunt of traveling with a kid and associated luggage. NPY insisted we didn’t use an airport cart – they aren’t free anyhow – in order to maneuver everything to the median where we waited for the shuttle bus to the car rental. It seemed like since we went Budget, there were correspondingly fewer buses. And when we got to the car rental, knowing that it takes time to process each customer, kiddo and I raced off the shuttle bus to be second in line and somehow NPY managed in one trip to balance the car seat and stroller on two suitcases! Kiddo pointed out Jeeps in car lots and I said we wouldn’t get a Jeep as a rental, assuming that we got a sedan as usual. But NPY had rented a small SUV and it was a white Jeep Renegade. It took us a longer to set-up the car seat because we realized we didn’t have the UAS straps and had to go the seat belt route and it feels so unsecure to us. Then we were finally on our way to our friends’ house in Culver City, fortunately note far and they had mac ‘n’ cheese leftover from dinner to give kiddo for a 9 p.m. dinner! Our California-loving friends (CLFs) had booked their trip to California and arrived a day before us and would leave a day after us. Given we’d meet up further south in Legoland and all head to Disneyland at the same time, we had a similar pattern to our travel. I know they love Venice and NPY doesn’t get it so I made sure we’d spend the day together in Venice. It turns out what they like about Venice is not the beach or the canals. It is all centered on Abbot Kinney Boulevard which reminds us of 4th Avenue in Kitsilano and they enjoy the restaurants (Lemonade or Gjelina), coffee and desserts (Salt & Straw for ice cream and Blue Star donuts). They like to stroll along the street and poke into shops and it was a nice palm tree-lined street. 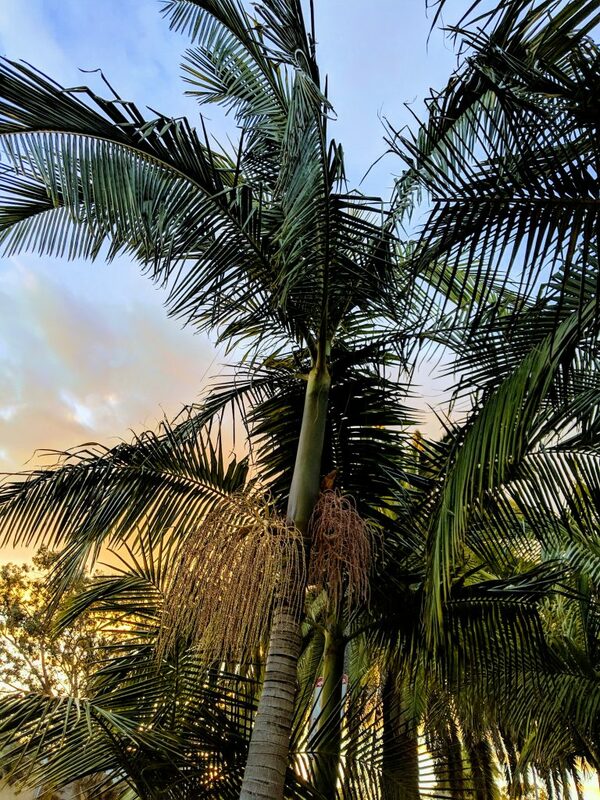 I particularly admired the light cast through the palm trees during sunset, which happens dishearteningly early during vacation because we had travelled closer to the equator. We split from our friends after Venice and went to dinner on our own to check out Westfield Century City. I felt guilty that we rolled in so late in the evening the first day and would spend our first day with others. But the first evening, our hosts and kids were still up for a bit longer and on the first morning, since CLFs aren’t early morning people, we could chill with our hosts before heading out to Venice. Our host makes an oat bran cereal that is higher in fiber than using rolled oats and goes down better with kiddos who find steel cut oats oatmeal unpalatably squishy. 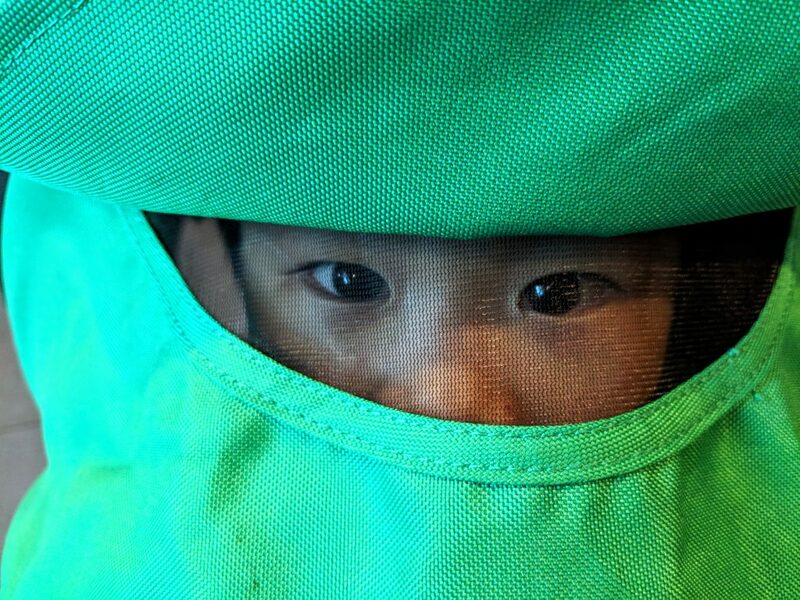 So we went to Whole Foods and for coffee while our hosts’ kids went to “ninja class” – sounds awesome – and met up with them at their frequent hangout, Westfield Century City. There, in food court dining, the kids don’t have to be reined in so much and you get to enjoy being outdoors. While kiddo enjoyed running down the empty halls of the mall the night before, he had fun with two older kids chasing them around rock sculptures while the adults could hang out together a bit. Otherwise, our hosts with twins, don’t do a lot of formal dining for the time being. I wanted to get one of my LA wishlist ideas done but kiddo fell asleep in the car after chasing the twins around and we drove from Century city past Griffith Park. We had to take a detour through Coldwater Canyon and Laurel Canyon which I don’t think we’ve driven through previously and it was fun with the turns and elevation changes and glimpsing the kind of life people who live in the hills might have. I checked out a Barnes & Noble in a former movie theater on Ventura Blvd that NPY deemed dingy. It was a tiny bookstore and my conclusion was to just give our hosts a Canada-esque maple-scented block candle and two grocery store gift cards. We learned that CLFs were at The Grove and I whined to myself about going to The Grove again but it was nice to be reminded how pretty it is at night with the lights. Kiddo loved watching the fountain which brought some nature scenery to the place. NPY asked our hosts if celebs were spotted at Century City – haha, no. But The Grove is the glamourous spot where you might. We left The Grove to try to get into a pizza restaurant and ended up at an In N Out for a super late dinner again. 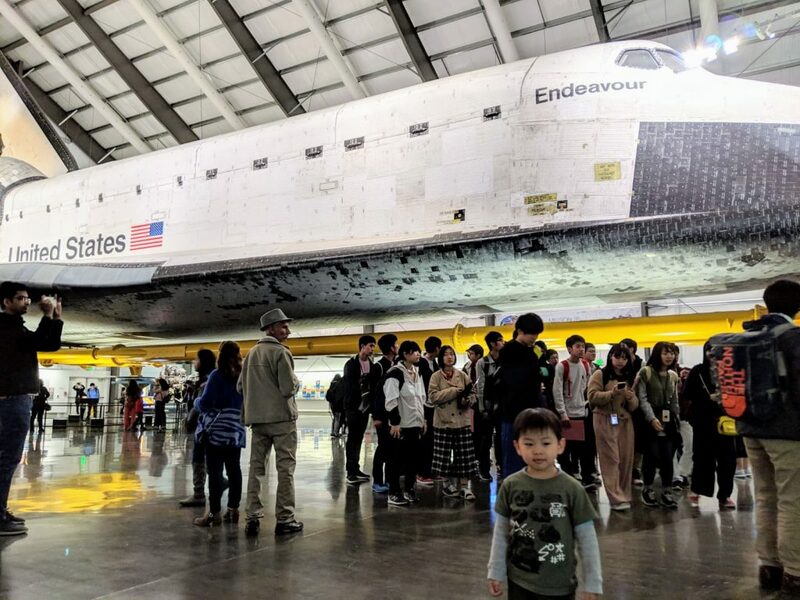 I wasn’t really interested in going to the California Science Center but after running some ideas by our hosts (Griffith Park, LACMA), it seemed like CSC was most kid-friendly. And it turned out that trying to see the Endeavour ($3 surcharge) wasn’t a hard thing at all to do. As I suspected, CSC was boring to me. It’s not like I know everything, but that it’s not areas of science that hold much interest to me. When we went through the Endeavour exhibit in the main building, I made the newbie mistake of thinking, “This is it? !” But then headed towards the hangar/warehouse where the shuttle was and that was cool. I wish I could decide on a NASA souvenir but ended up with nothing at all. Our hosts and CLFs were also at CSC. The outdoor rose garden maze was under maintenance so they couldn’t enjoy it. It was my birthday which I kept quiet about from my hosts (CLFs knew) so after CSC we might have gone to Target and Trader Joe’s while kiddo slept in the car. Then we had dinner and dessert in Sawtelle Japantown. We were preparing to leave our hosts on Sunday night in order to set out as early as possible from Culver City to Legoland in Carlsbad, including doing a load of laundry. We had watched some YouTube videos about Legoland and I wasn’t sure what to make of it given the production quality of the videographers. 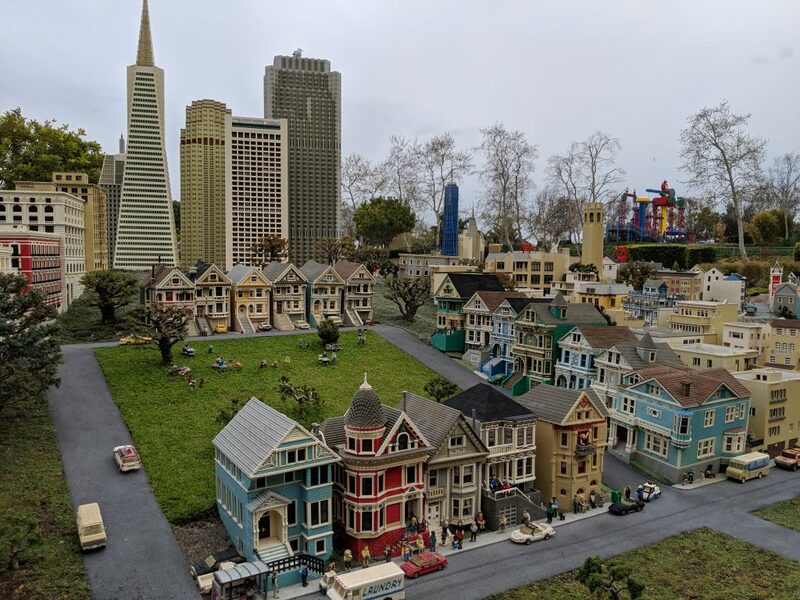 After pitstops at Costco for gas – our postal code-turned-zip code was not accepted for NPY’s previously-untried credit card so thankfully we had a Costco cash card – coffee and a snack, we arrived at Legoland at 11:30. They opened at 10 a.m. and CLF were there about half an hour earlier. I was surprised how quiet it felt in the lot and how quiet it seemed in the park. It wasn’t a fantastic day and would eventually rain and be miserable for me. But for the kids, it was fantastic enough with cute rides and accompanying videos. It wasn’t crowded so the kids could have much more free rein. Some things Lego-fied are cute, others are okay. Kiddo loves having driven a car and since I was the one piloting the helicopter since he couldn’t reach, it’s “meh” to him. He still remembers the submarine ride where we searched for treasures and tapped on a screen what we found. I was enamoured by Miniland USA and remissed that we didn’t go on the Safari ride. I never understood what Ninjago was about and after going on that ride because there was no minimum height, we felt bad for kiddo who was upset by the dark ride and frantic and violent visuals. I was starting to get a cold – in late winter! – and ignored it but by the time we were in San Diego, it was difficult to ignore and I needed to get some Cepecol. We did the calculations and it was the best deal for us to get a two-day San Diego Go Card through Costco.ca and have no exchange rate “surprises” on my credit card. Next best deal was to get the Go Card on Groupon. In a two-day span, barring unforeseen circumstances, we planned to hit the “big 2” of Legoland and San Diego Zoo. What if we somehow missed Legoland the first day and then have to go all the way to San Diego and just last-minute get into the zoo, etc? What if the Go Card didn’t actually work? My private fears. A couple of years ago, I took kiddo for the first time to the zoo in Toronto and this was our first time as a family and I was ultra-prepared. Who zoo grounds are so big and a stroller was necessary! And I didn’t need to worry as much there would be an ice cream cart at every corner as there was in Toronto. As usual, I didn’t take that many photos. What are my photos and crappy videos compared to National Geographic or many that you find online? At a zoo, it is an unpredictable mixture of exhibits we breeze by and those that kiddo forces us to linger at. The most memorable exhibits for me were: (1) the lion male ambled up a rock and facing us and kind of roared several times but it sounded more creaky than you’d expect (2) the elephants not doing much interesting until one of them took a really long pee (3) the gorgeous flamingos that welcome you and kind of contortionist level twisting they do with their legs and necks (4) getting meditative watching the gorillas, wondering what they are thinking. And a memorable experience was waiting half an hour for the Skyfari (aerial tram) with kiddo – NPY didn’t want to wait and logistics of having a stroller – and I wasn’t scared but NPY is and kiddo wasn’t scared. But after we loaded and just before starting, he hugged me and told me actually he’s a little scared. And I was able to teach him that it’s okay to feel scared if you haven’t done it before. But give it a chance and he was soon not clinging to me. Also, the zoo souvenir we got – a spinner light thingy – was just right to amuse the kid and have a semi-practical use. We stayed at the zoo nearly or over five hours and kiddo passed out in the car soon after we loaded him in. NPY heard of the Gaslamp Quarter that is supposed to be like Gastown in Vancouver. Not really… I stayed in the car with kiddo while NPY wandered around a little and reported back that it was thoroughly dingy and sketchy. I know there’s areas of San Diego we didn’t have occasion to visit because it was kind of all about Legoland and the zoo. The next morning, I was grateful to check out of the motel and we were on our way – no real rush – to La Jolla. Once we got there, parking was a bit of an issue and I was getting antsy about time ticking away, needing to get something for lunch, etc. After not seeing a great deal of nice parts of San Diego – apparently we missed out on walking around our own area, Mission Bay – getting to dreamy La Jolla is like going to “real California” or the paradise portion. Big waves, shorelines that stretch forever, wide streets and stucco houses. We stopped at a local coffee shop and they advised me a little on the sights I planned to see. It didn’t seem like I was going to have (willing) company to visit The Cave Store and walk down the 147-something steps but I also honestly feeling the time pressure – next time! 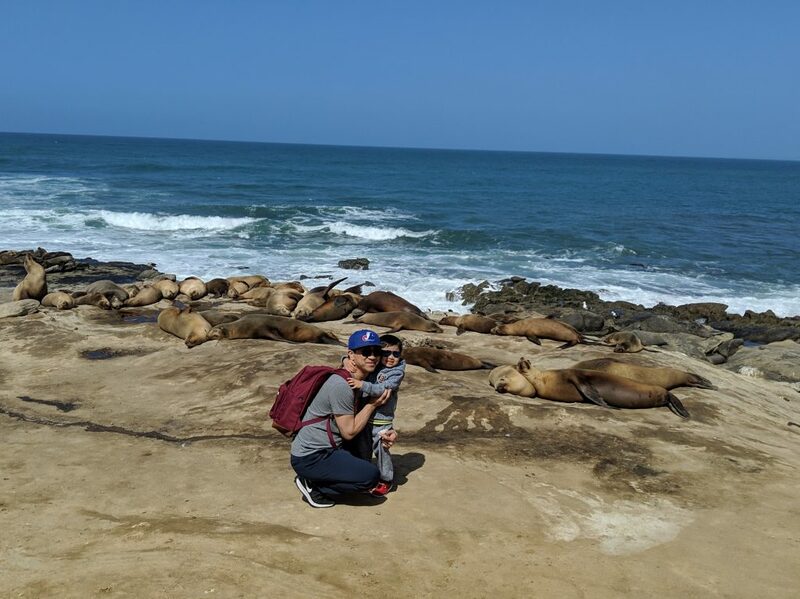 We visited a lookout at first and then walked along the walkway to Children’s Pool where NPY and kiddo got closer to the sea lions and seals. After lunch at Duke’s kiddo fell asleep in the car and faced with traffic, NPY asked if I really wanted to swing by my firm’s San Diego location which is in La Jolla. Figuring that there wasn’t much to see and I could see the building, if not signs, from the highway, I agreed we could pass. Not far from that point, we pulled into Westfield UTC (University Town Center) because I looked up where we could load up on more 85 Degrees Bakery. Turns out the mall is pretty new, serene on a Wednesday afternoon, and had some nice touches. After NPY did a round and I had a short nap in the car, I went for a walk to go to the bakery, check out the mall and stretch my legs. I was caught up in Typo, an accessories store that is part of the Cotton:On brand. Then we were on our way to dinner and our first night in Anaheim. It was as with quite a bit of trepidation that I approached our first day at Disneyland. We didn’t watch the official planning videos. We didn’t look at the maps or figure out which rides we could do, had the line-ups, listen to hacks, etc. 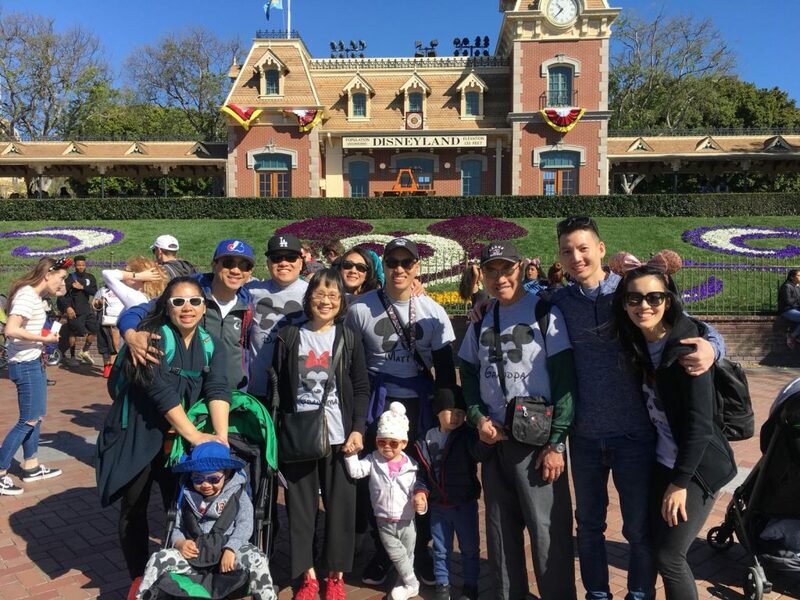 CLFs go to Disneyland like once a year for the past decade so NPY said he’s happy not spoiling the “surprise” of returning to Disneyland after all these days and tag along with CLFs and their Disney-loving family. CLFs had their whole gang represent: NPY’s hockey teammate, his wife and toddler, his sister, her husband and their toddler, his brother, and his parents. We were a group of 12! It was pretty busy for a Thursday but nothing compared to the next time we’d be there. First, we queued up for the Pirates of the Caribbean ride which had no height restriction but kiddo was terrified and how do you explain felled skeletons (he finds skeletons fascinating) with a sword through them? Fortunately, I didn’t have to because we just covered his eyes and ears and he would say that his least favourite part of Disney was the Pirates ride. Then we made our way to Critter Country and went on The Many Adventures of Winnie the Pooh ride and queued to have photos taken with Winnie, Tigger and Eeyore. That was the right choices because toddlers love the giant, friendly stuffed animals. We dined on the patio of Hungry Bear and then I learned about Fantasyland. Kiddo wasn’t interested in or feared the dumbo ride so we rode Mad Tea Party which he immediately wanted to do again. The first ride we did in Fantasyland, however, was Casey Jr. Circus Train – not surprisingly – kiddo immediately connected with the cute train. Teacups happened to be one of my best memories of Tokyo Disneyland where my cousin told me to spin the table and we did it so effectively. We did the Alice in Wonderland ride at some point – I don’t connect with that zany story at all. We were just about to leave Fantasyland and realized we had a front row view of Mickey’s Soundsational Parade at 3:30 and the splendid floats passed by. It was super-stimulating and happy. Then we were in Toontown and it’s so surreal and cute we had to peel him away crying. It was in the shadow of the Matterhorn with the Nemo submarine on the other side where it was finally peaceful and least stimulating we got kiddo to fall asleep. At that point, we went back to tiki land to get Dole Whip and just stroll around. We queued up for Finding Nemo Submarine Voyage and I wondered why the floor was wet. I think kiddo continues to be fascinated with the underwater world and I need to keep bringing him to the aquarium while I maintain my membership (and he’s free). We went on the Buzz Lightyear Astro Blasters and while I hoped it was a positive introduction for kiddo to Toy Story, I think it was too frantic. In a way, we were killing time a little and then we were on Main Street USA in the crowd and dancing to Mickey’s Mix Magic with Fireworks where in a medley of graphics were projects on the facades, “snow” was falling on us and… no fireworks? We couldn’t tell, but the weather conditions were not ideal so they were not set off and we almost wondered if we were in the wrong spot – we saw some going off as we drove into Anaheim the night before. Although the park closed at midnight, we left right after the fireworks. Our second Disney day was spent at California Adventure Park which opened in 2001 and so it was legitimately my first time there. Our other friends from Vancouver’s first Disney day was at California Adventure and they were in an hour before us. We would ultimately only see NPY’s friend and the toddler as the older sibling, mom and other friends with older kids (the older sibling’s age) could ride on all of the rides. Our friend said they were in a 90-minute queue queue for a “Cars ride” but there were three and the queue for Mater’s Junkyard Jamboree was not bad at estimated around 15 minutes. Turns out our friends were queued for the Radiator Springs Racer ride that kiddo wasn’t tall enough for anyhow. After Mater’s which swung us around more than I bargained for, we played catch up with all the friends and met up at Pixar Pier. NPY enjoyed the more laidback feel he immediately perceived in California Adventure. We were get our first FASTPASS- surprisingly to me, CLFs did not buy MaxPass which is a cost of $15 per day per ticket. The park really isn’t so bad to cross and there is a limit to how many Fastpasses you can have at a given moment. I think when you have a multiple-day pass, you can take it easy and let the timing of things flow. Our first FASTPASS was for Toy Story Midway Mania and not until later in the afternoon. CLFs went to the arcade and since I don’t really subscribe to that, we lined up for a the ferris wheel – kiddo’s first time! – for a non-swinging gondola on the Pixar Pal-A-Round. As we were queuing, the kid lining up after us spat his soother out, towards the edge of the platform where we weren’t to tread and I thought to myself that the kid looked old (large) to be using a soother like such. It turned out we’d be sharing a gondola with him and his grandmother. It was a fantastic ride where our first go-around was quick with no stops but it was slow on the second rotation as about four gondolas unloaded at a time. As a result of being on the ferris wheel, we missed the Disney Junior Dance Party that CLFs and other friends went to. We went on The Little Mermaid ~ Ariel’s Undersea Adventure – finally, a ride in the dark that didn’t freak out kiddo. Is he extra sensitive or adorably sheltered or just normal for a 43-month old? 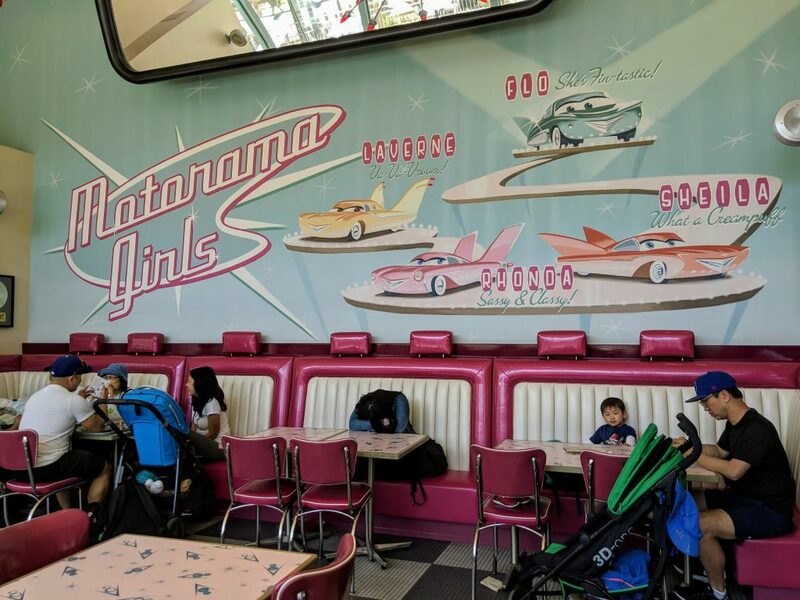 We went joined CLFs at Flo’s V8 Cafe but they were finishing up and left and that is fortunate because partway through the meal, kiddo gagged on some mac ‘n’ cheese and started throwing up. I felt so wretched in that instant because we knew he was catching a cold a little (like myself) and at the back of my mind, I knew he might be getting affected by the heat if not suffering from (mild) heat stroke. We were definitely attentive to kiddo’s needs after that point and plied him with plenty of water and lighter food for the rest of the day. He slept very unfitfully (like just 30 minutes) but that gave me and NPY a chance to return to Toy Story Midway Mania and shoot things up to our heart’s content. He’s quite proud that he was Best in Vehicles (i.e., our cohort of 12 or so) but not nearly close to best of the hour or week! Yes, he tripled my score and that’s because I only managed on the fifth and last mini-game to figure out that “spring-loaded” doesn’t mean that I had to release every time, find the knob, and pull again. And, my accuracy was twice his. Carsland was a really cute and self-contained area. It wasn’t quite what we expected but what do we know. Radiator Springs is significant enough and a well-developed town concept, I think. While kiddo and NPY queued up for Luigi’s Rollickin’ Roadsters, I spied Lightening McQueen rolling down the street for photos outside Cozy Cone Motel. But the photo session wasn’t long enough and McQueen was just rolling away when they got to me and – surprisingly – kiddo wanted a photo with Mater more than with McQueen. He was definitely on the quieter and demure side after the vomiting and lousy nap bout. I knew we could not possibly stick around until 10 p.m. when the World of Color show took place but we walked around some more, admired the optical illusion in Hollywood Land, attended the Turtle Talk with Crush in the Animation Academy, enjoy a bit of the evening vibe at Disney and then leave the park around or just before 8 p.m. in order to get something more neutral into kiddo (and us). NPY returned to the park to catch World of Color and then spend the late night with CLF getting beers and sandwiches at Downtown Disney. 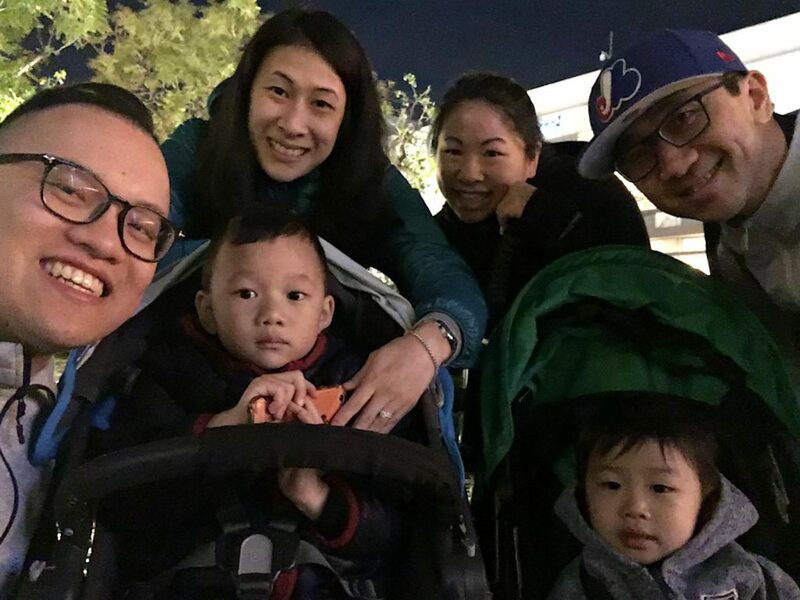 While CLFs took a break on day 3 – they have a four-day pass and would use it over five days – we were back at Disneyland Resort for a third Disney day in a row. We were going to use FASTPASS to the hilt (as opposed to not at all) and take advantage of mobile ordering. I did minor planning the night before, circling rides I wanted to check out, and noting which ones had FASTPASS. We were later than ever getting to the park, after 11, and felt the difference from the first day for it was Saturday and families on March Break had arrived in town. It was bonkers. But we hadn’t the largest itinerary in the least. Item 1 on the agenda was to get onto the It’s a Small World ride and a few sordid ones in Fantasyland so that kiddo has extensive exposure to it while he’s young. While we waited for our It’s a Small World timeslot, we did the tea cups for a third time, finally where all three of us were on it together. And we went for a mini cruise in the form of Storybook Land Canal Boats. We took Disneyland Railroad around the park and were disappointed the dinosaur diorama was under maintenance. Kiddo didn’t connect with Mickey and the Magical Map, the show at Fantasyland Theater but I was glad he did like and would sing after the fact It’s a Small World because he has no previous exposure to that song. Lunch was a far cry as there was no hope for a table at the small patio for Harbor Galley but I did find a bench in the shade and plied kiddo with food before allowing him to have a popsicle. We went on Roger Rabbit’s Car Toon Spin which I also thought too zany – I’m way too serious – and kiddo explored a bit around Toontown again. While kiddo napped, we shopped in browsed in peace for souvenirs for family and ourselves. We excited the park in order to visit Downtown Disney and saving us from visiting the next day as originally planned. A java chip frappuccino hit the spot and gave us the energy to tackle the massive World of Disney store. I was on the lookout for something like kid dinnerware and kind of useful household items that I believe my mum got at Tokyo Disneyland (but could have been from a department store in Hong Kong) and it really was largely apparel, and tons of mugs and we don’t need more mugs. We got some t-shirts (2 for $30 deals) and I got a “Powered by churros & pixie dust” workout tank top. NPY and I have different styles when it comes to souvenir apparel, it turned out. While he was looking for something traditional and possibly vintage that states Disneyland and has Mickey Mouse on it, I want to skirt the issue and have an “inside joke” connection, like the shirt I picked up. Once upon a time, I picked up a roller-ball of Disney branded perfume called Pixie Dust and it’s fruity and I liked it and its name. I couldn’t find it again in the same dispenser and now I think that scent is no longer offered. Or like the t-shirts I selected for kiddo and his bff, states “I’m just here for the snacks” with Mickey Mouse shaped pretzel, a carton of popcorn and a pizza slice with Mickey Mouse silhouette pepperoni slices. Ironic because of course kids loves the rest, but true that kids could just subsist on snack food alone. I also browsed around WonderGround Gallery and wanted cute collage pieces but we can’t justify it or have the wall space. And I visited the Disney Home store and they didn’t have anything I didn’t see in World of Disney. Kiddo woke up and he was in such better spirits than I could have hoped for given the events of the day before, but he was still more attached to us and declined more activities than we’d imagine, than the first day. Three days was just enough if we all stay healthy! We were able to entice interest in him to queue up for Autopia – I didn’t expect he was tall enough to ride. He loved the ride and wanted to go again but was a good kid that when the second queue was tremendously long, he agreed to not riding again. Conscious it was our last day at Disney – and I kept reminding kiddo of such – we just absorbed the atmosphere. We found gifts in the form of glassware at Crystal Arts, which is prettier than mugs. I secretly wanted NPY to agree to engraving for $3 for a whole name but it was gifts for his family and when he declined the surcharge, I didn’t argue. I considered a mug or tumbler for myself or kiddo and no designed jumped out at me so I guess that’s something for next time! There was also a vending machine in Carsland in Sarge’s Surplus Hut that dispense personalized keychains/identification tags for about $20 after personalization, I believe (it was $12 for the tag alone) that I wanted and didn’t have time to walk through the options. We had to stay on until 9:30 for the light show and hope that fireworks would be take place. They did and it was splendid fun and perfect way to cap it off our visit to the resort. The Sleeping Beauty Castle that fireworks would frame was under wraps, being redesigned, unfortunately. NPY deposited us at home and then head out to visit more breweries and ring in CLF’s birthday in California! 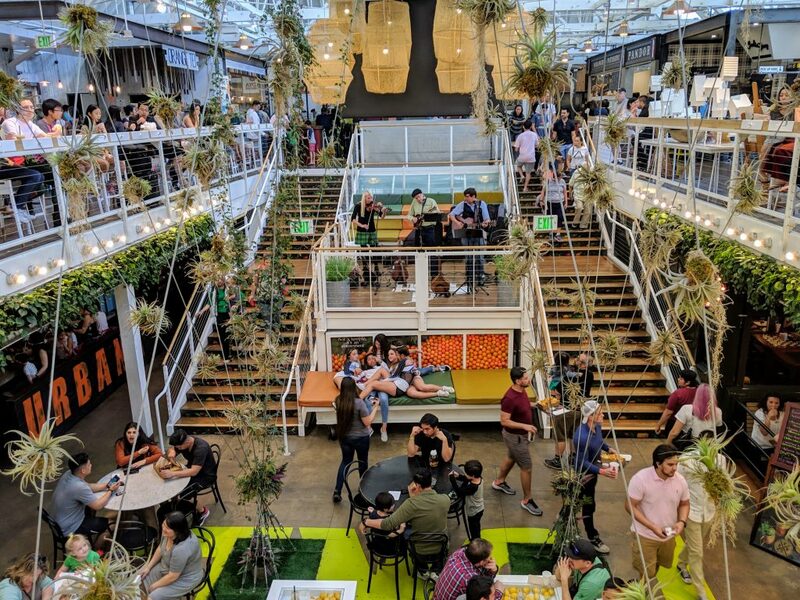 Finally, we got to visit the Anaheim Packing House/District and it’s a splendid place to hang out, bring a kid and get food. Kiddo loved the tractor with no restrictions to climb on, riding on a saddle, the giant swing and throwing himself on the tiered “sofa” between staircase landings. 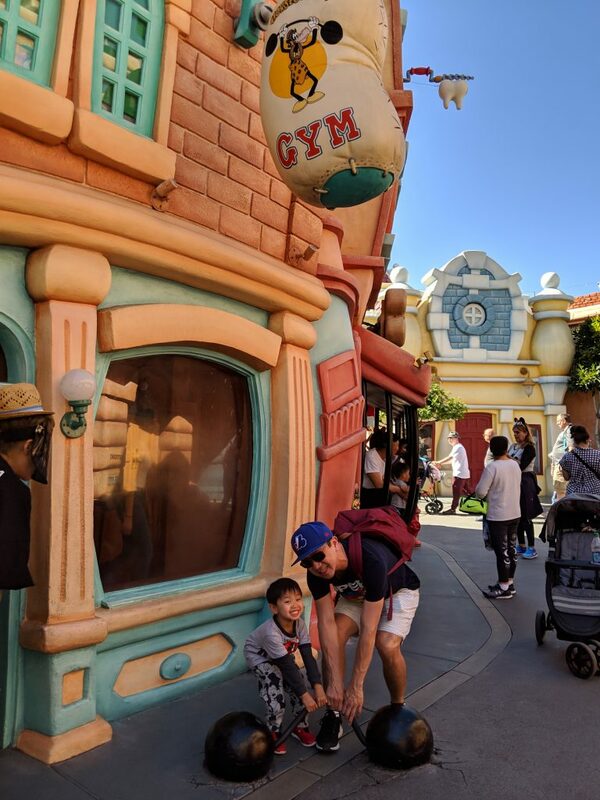 It had a great vibe and I can see why it’s a must-see and I wonder what a quirky economy Anaheim has with Disneyland in its borders and what else it had to offer to complement people’s Disneyland vacation. I still wanted to visit the Watts Towers which was on our way back to LA and to the hotel near LAX but given the option, NPY would rather walk around some outlet mall. Given a choice between Citadel Outlets in the city and not on our way – thus risking some mind-numbing drive across the city to LAX during rush hour – and The Outlets at Orange south and out of our way by 10 minutes, we opted for the latter. I can’t say it was the best decision because we were kind of miserable in the heat but we got some shopping done. It felt like a strange outlet mall, much more like a mall, not very premium at all in terms of store selection. Then we were back on our way to LA and the prospect of being stuck at our LAX hotel because of the area and no longer having a car. I checked us in and it took a couple of times exiting and re-entering the parking lot (20-minute max for free else you pay an overnight parking fee) to unload the car and then bring kiddo (who was asleep in the car seat) upstairs. NPY dropped off the car and walked back to the hotel reporting on the sketchy activities in the neighbourhood. So we stayed in save for a walk to the convenience store connected to the gas station next door to get some water. So relieved I was that living out of a suitcase – even if I felt pretty organized throughout – was coming to and end. We had to be mindful of time and catch an airport shuttle around 9:45 to make it to the airport by 10:15, two hours ahead of our flight. Bye bye “pom” trees, as I taught kiddo what to call them. I went to get a cart this time so we’d transit in comfort and was dismayed it was $5 a pop. Sheesh. But it was handy when we were shuttled up and down floors and I was pissed that a vulture asked me to take my cart at the point when we could (and should) relinquish it. So opportunistic. We missed Shake Shack breakfast by less than 10 minutes and maybe it wouldn’t have sat so well with us but it would have been a cool send-off meal! We got plane snacks from Starbucks and a mini market instead and eventually boarded our flight. Kiddo fell asleep at the tail end of the flight so we weren’t in a rush to get off the plane and he woke shortly after we deplaned. So that’s our sure-to-be big trip of the year and a great success if you ask me!